Working on an ART Sherpa Original Design for Spooky Town . . . . . I don't normally use other youtube videos for direct inspiration however, I could not resist this SUPER CUTE "Spooky Town" by Cinnamon Cooney, MY Art Sherpa. I love watching her show. I love the way her and John interact together, how they show affection for one another openly and just the general vibe they give from their show. So when I saw this pop up on my notifications I thought WOW! that's super cute! I just have to give it a go and see what I can make of it. 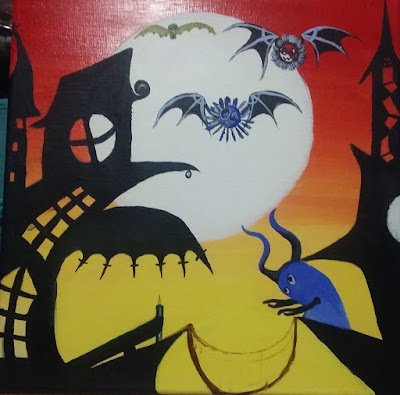 Now, I used a 12x12 canvas instead of the longer one she used because that's what I have. I bought a pack of 7 at Michael's a while back on sale and busted them bad boys out just for this occasion. Now I'm thinking I could add on with the other spooky & cool paintings they have been putting up for Halloween. It's seems like I'm just loving them one after the other. Thanks to Cinnamon and John for their hard work and wonderful show they put out FREE for all of us! I'm truly thankful for you and your whole family really cuz I watch your Mom too :-) Not a member of her Live Gallery site yet but I'm tossing it around but that's another post, lol! Hope you like it so far, it's a W.I.P. and I will be updating this post with pics as I go so stay tuned :-) and as always . . .
Go out and Create something beautiful today! W.I.P. photo #1 painted by Maria Meade aka Reeah. using System3 acrylic paint by Daler Rowney on a primed 12"x12" canvas.